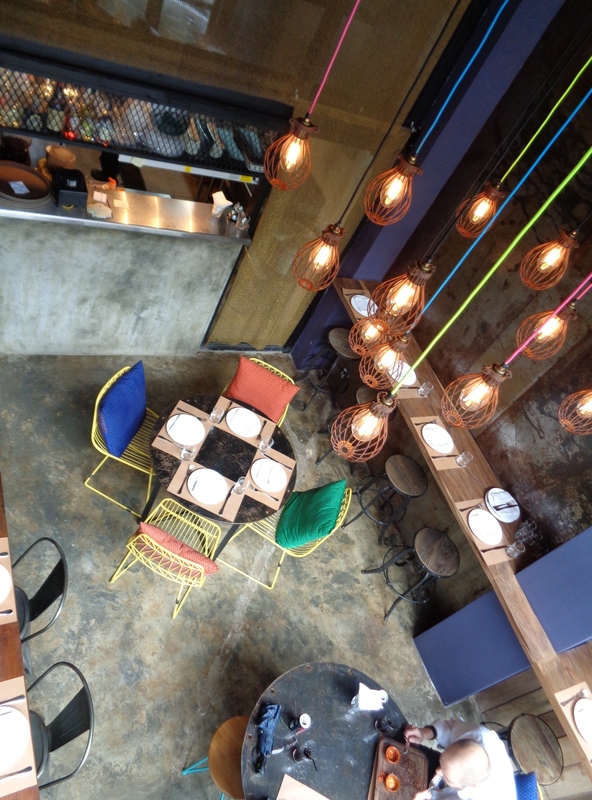 Toba Restaurant and Café in Yangon’s trendy Yaw Min Gyi area is celebrating its first anniversary this month, which is no small feat considering how fickle and fraught the city’s bar and restaurant scene has become of late. Toba remains one of just two Indonesian restaurants in town and one of the very few 24 hour establishments – at least on weekends. Since June 1, its opening hours from Sunday to Thursday have been cut back to 7am until 1am, which is still by no means a short shift. 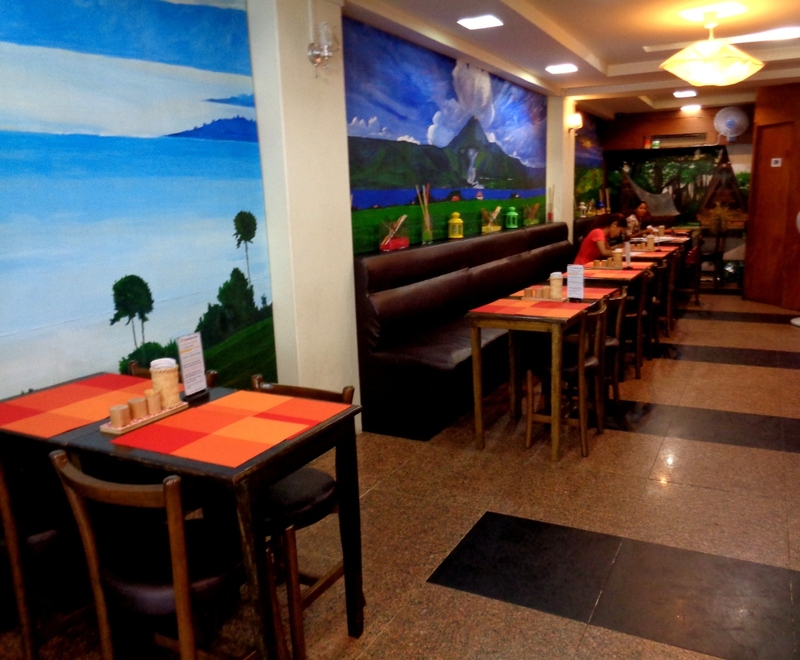 Unfortunately, there still seems to be a few bumps in the road in terms of Toba’s service standards, but the food and value for money compensate well enough. For those uninitiated with Indonesian cuisine (and I must confess I am no expert), Toba’s almost implausibly extensive menu includes helpful descriptions and a photo of every dish. Do note that whilst beer doesn’t appear on the menu, it’s available all the same (staff will collect it from the shop next door without any additional charge). There’s a bit of poetic licence going on in terms of describing many dishes as ‘Indonesian-Western style’ when they’re clearly anything but. The ‘chicken macaroni soup’ comes to mind – but I won’t go on because it’s a bit of a quibble. The shortcomings of the nasi goreng were less easy to gloss over. 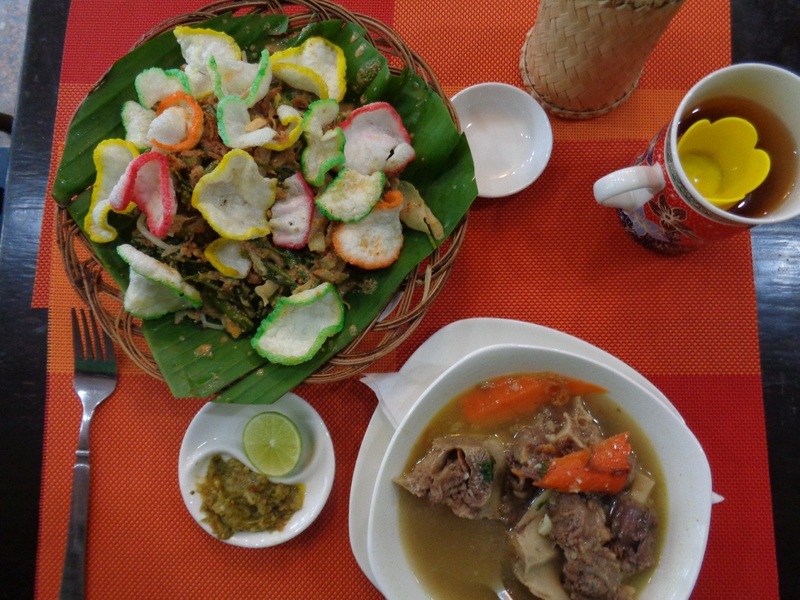 As one of Indonesia’s national dishes, I was surprised to learn that the mutton variety (K3,400) was unavailable. So I opted for the sapi (beef) instead, which I took home as a parcel for my husband. My sampling of it later that day proved disappointing – it looked and tasted a lot more like a bland and greasy Chinese fried rice, without any kick whatsoever. 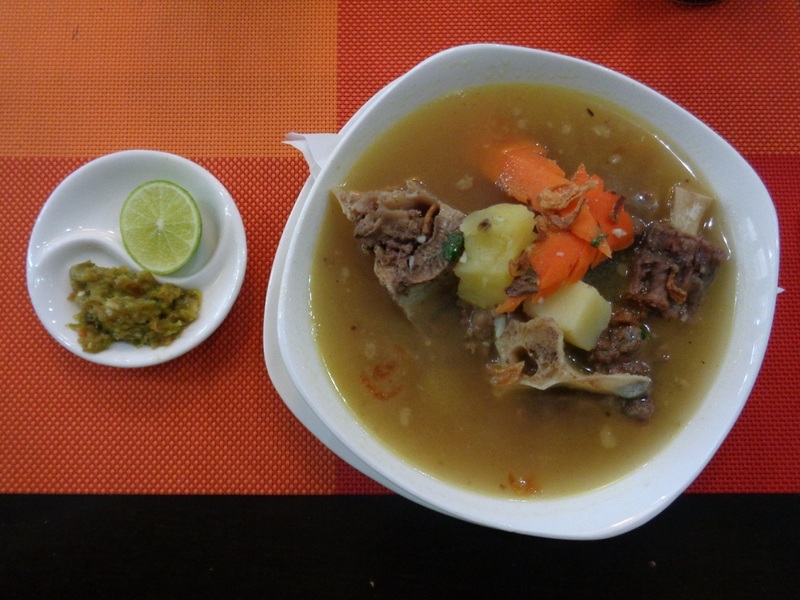 I started off my meal with the sop buntut, which is a “submerged oxtail in a traditional recipe soup, covered in pot and boiled with slow fire for three hours.” It came with a wedge of lime and a fiery green chilli paste and cost K4,100. It was a heartily flavoured soup and the delectably tender chunks of meat slid off the bone. The soup was accompanied by gado gado, which is a much loved mix of crunchy greens and peanut sauce and decorated with deep fried krupuk (a close equivalent of prawn crackers), which at Toba, sports neon trimmings. Whilst Toba has an attractive upstairs seating area featuring traditional wooden seating and a laid back Balinese décor, the downstairs section is less inspiring. The walls are adorned with gaudy murals of volcanoes and other Indonesian landscapes and the seating is a little cramped and cafeteria-like, though there’s a booth at the back that’s more spacious and suitable for groups of up to a dozen. 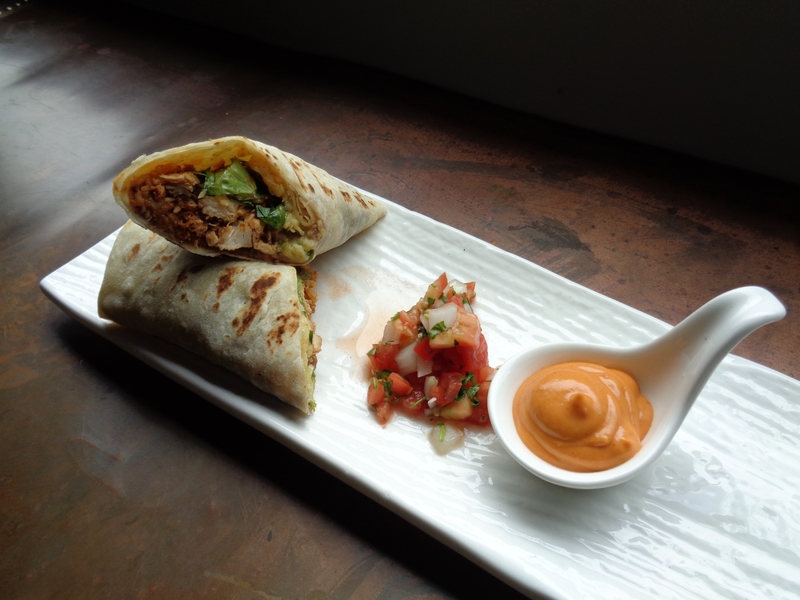 The staff were friendly and attentive and the dishes appeared with impressive speed – nothing took longer than 15 minutes. However things went downhill when I went upstairs and stumbled upon a waiter relieving himself in Toba’s sole lavatory with the door wide open. After finishing off he simply waved me in with a grin, which I guess was preferable to a flurry of awkward apologies. Prices are another of Toba’s strengths. They’re very reasonable, especially considering that the portions are generous. Three mains and a jasmine tea came to just K10,017 and this included a five percent government tax of K400. I assumed the 17 kyat would be written off so I was startled when the waitress asked me to cough up the exact amount. Whilst 20 kyat notes still exist as a denomination, I only encounter them once in a blue moon: in fact I keep one at home as a souvenir. When I said I was befuddled as to how I could pay such an impractical sum, the waitress launched into an explanation about the government’s new tax schemes. Midway, she caught sight of the 50 kyat note peeking out of my wallet and asked me to give it to her. I was perturbed on principle and began to protest. At that moment, a waiter sprang up from behind and whacked a 50 kyat tax sticker onto my bill. 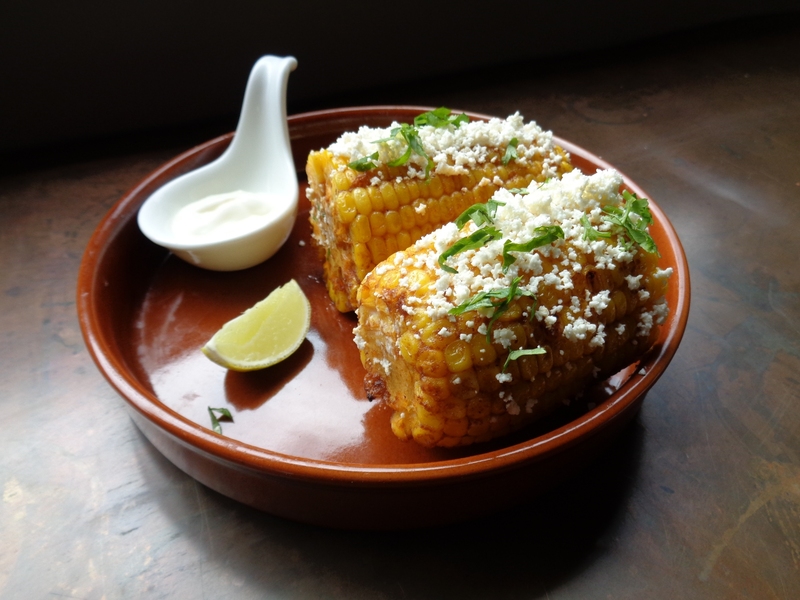 When they understood that I remained unconvinced and opposed, the waitress agreed to give me a “discount” on my bill – a term she repeated with grating effect. It wasn’t until much later that I realised I’d been too flustered to ask for my anniversary promo discount of 10 percent and the free dessert the male waiter had promised me when I first sat down to dine. The opening of BB Cake and Coffee in Parami, a chic and spacious cake, coffee and pastry shop, is yet another indication that Myanmar’s commercial capital is creeping northwards. 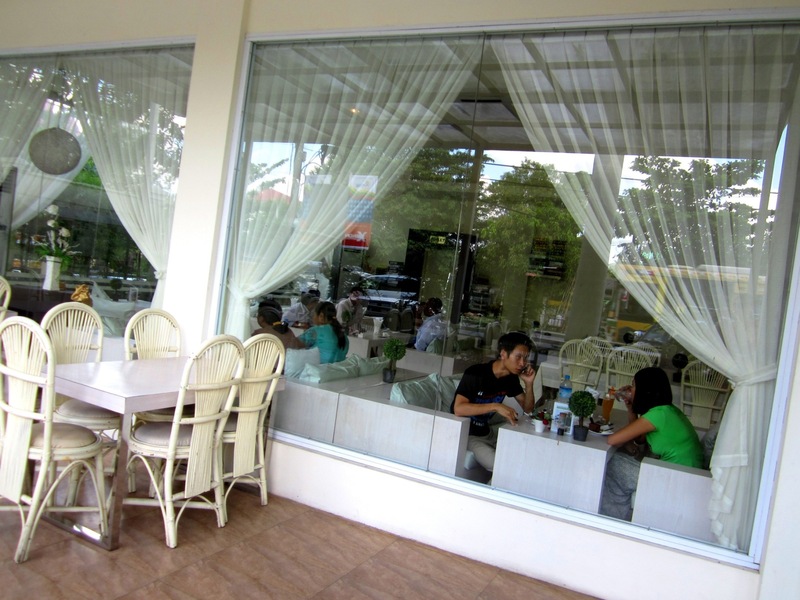 When BB Cakes opened on the corner or Parami Road and Myint Zu Street about four months ago, its elegant exterior instantly made it a landmark in the local area. This place is practically impossible to miss – especially at night, when it’s lit up by a warm lighting scheme that softens the edges of the white building, which is complemented by a fringe of tall palm trees and shrubbery. The gala opening even made it onto MRTV4. It’s opposite the high end salon, Stag, on Myint Zu Street, where Yangon’s male celebrities reportedly go for hair-cuts. Step inside BB Cakes and it feels as though you’ve walked into the spread of an interior design magazine. Within three steps you’ll be greeted by one of the many female waitresses who are dressed so smartly that they resemble air hostesses. The service is prompt and efficient without being overbearing. Cool temperatures and generously proportioned white couches paired with plump cushions make it easy to spend an entire morning or afternoon here (and there’s wifi too, though these days that almost goes without saying). There’s a lot of natural sunlight due to the expansive use of glass panels, but virtually no glare thanks to the surrounding vegetation and silky white drapes. Smokers can sit on the patio outside in cane chairs that are of course, white. Miniature “trees” in pot plants and watering cans sit atop the white tables and the stacks of books against the walls give it a homely feel, though sadly the books are actually just hollow cardboard boxes with about 12 repeated titles. Admittedly this is a very small point to pick on though. Iced coffees are served in boot-shaped glass mugs (K3,200) and the strawberry smoothie, while pricey at K3,200, had real pieces of strawberry at the bottom. 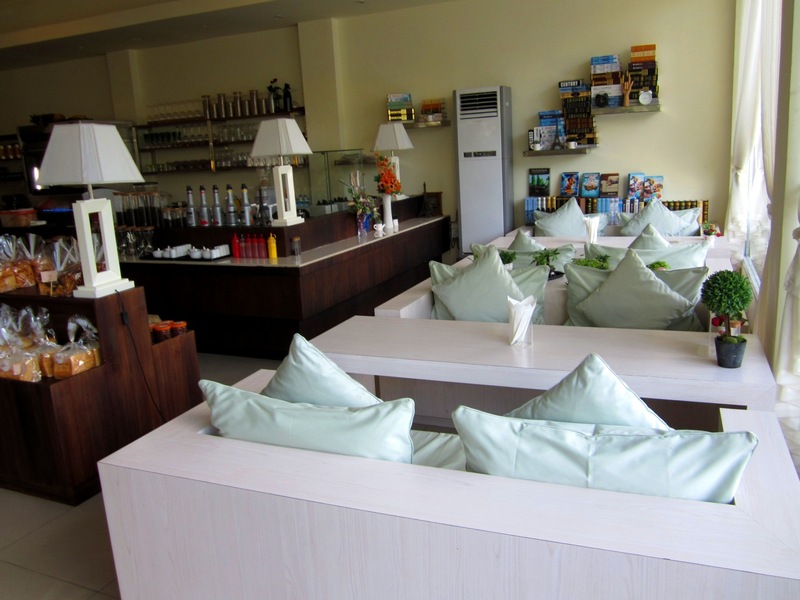 It also offers Myanmar’s famous avocado smoothie, plus papaya yoghurt and blueberry smoothies, to name but a few. 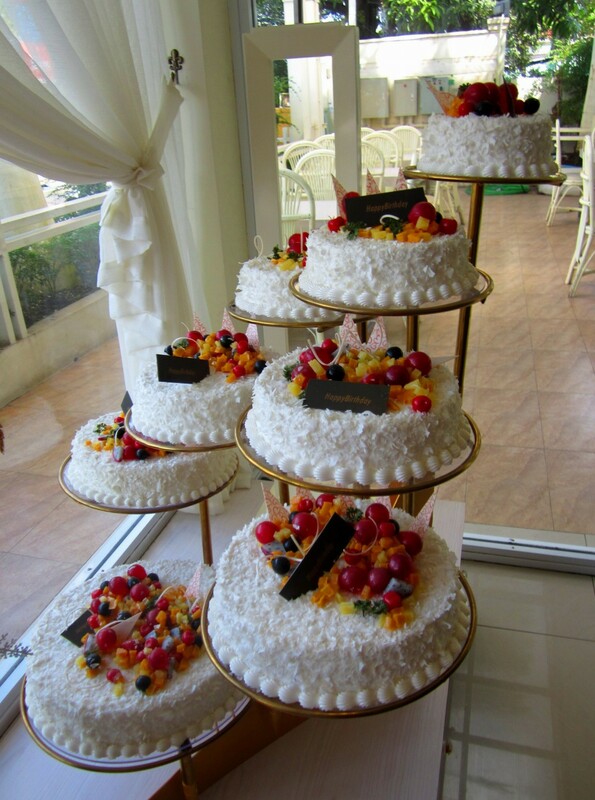 BB Cake and Coffee has eye-boggling window displays of cakes, which are available for home delivery and cost around K28,000 (excluding delivery charges). 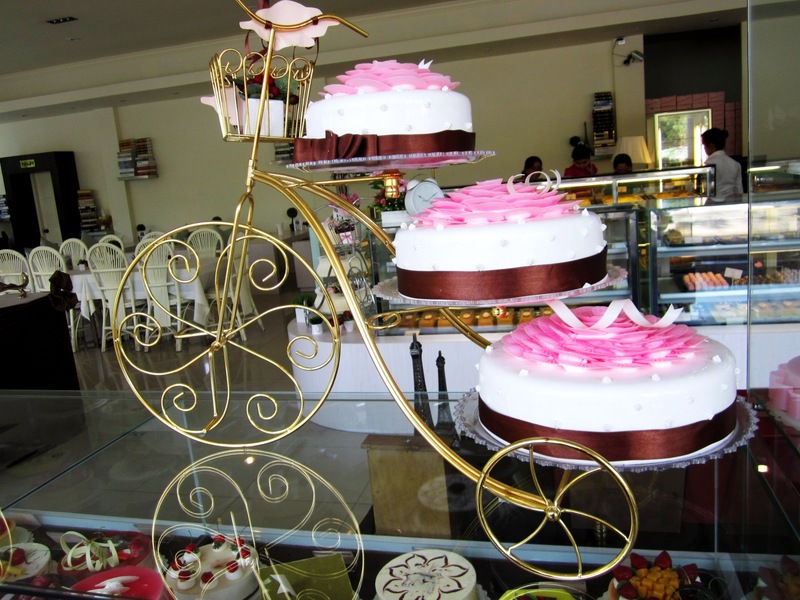 As implausible as it sounds, there are even cakes displayed on iron framed bicycles. Each bicycle has three oversized cream cakes perched on the place where a seat would go, plus one above that and below. But while a decadent birthday treat is one thing, BB Cakes is not for health conscious consumers. And brown bread lovers beware: there is nothing for you here but a pack of four brown bread slices that will set you back a surprising K1,800. Plain white bread is sold in slices of 10, for the over-the-top sum of K2,200. Although there are bakers on the premises, there are no baguettes or the like in sight and almost everything is sweet rather than savoury. Granted, it’s acake and coffee shop, but when items such as Fruit Pizza (K1,500) or Flower Sausage (K1,500) make an attempt to fill that gap, it seems that something less ambitious and more comforting and nutritious may have been a better way to go. The bacon croissant was served cold and contained a confusing spread of sliced cucumber and chopped cabbage in a mayonnaise dressing, which gave me a sense that a lot less thought is going into the food than the beautiful interior design. The chicken and bacon sandwiches on display had been deep fried and it was hard to tell if they were made of bread or the ubiquitous puff pastry, with a thin strip of bacon slathered across the top of the latter. Sadly the results were ultimately unappealing. For the time being at least, BB Cake and Coffee falls into that category. BB Cake and Coffee is located on No. 48 Parami Road (on the corner of Myint Zu Street) Parami. Please note: This review was published by Mizzima way back in December 2013 – so perhaps take it with a grain of salt (pardon the pun).